When you think of “stereotypical Japanese things”, what comes to mind? I imagine that many would respond with sushi, samurai, green tea, chopsticks, cherry blossoms, and technology. Japan has become synonymous with technology, and it’s an association that has been well earned. Despite the abundant technological advances that have been made here, it’s not like every day life is overrun with robots, and insane gadgets. The craziest that I personally experience on a daily basis are smartphones, and electronically embellished toilets. A lot of the time you forget how much technology Japan really has. This post is dedicated to a few spiffy inventions that have made me smile. I’ll be the first to admit that they may not be overly surprising, but they make me happy. If it makes you smile, then it’s done a good job. “Robot” toilets are pretty common nowadays. More and more public restrooms are getting revamped with “washlet” toilets that include features such as a bidet (for washing your bum and the surrounding area), warmed seats, automatic lids, and bird or water sound effects to mask the embarrassing sounds your body just might make. Below is a short little video of the toilets in the building of my school. There’s no sounds on these ones, but all other features are in tact. Gotta love opening that door, and seeing the lid pop up in such an inviting manner as if it’s saying, “Please come void your bladder in me!”. And of course the best part is that the toilet is pink. What more could you want in a woman’s washroom? Here is the control panel that’s mounted on the wall. 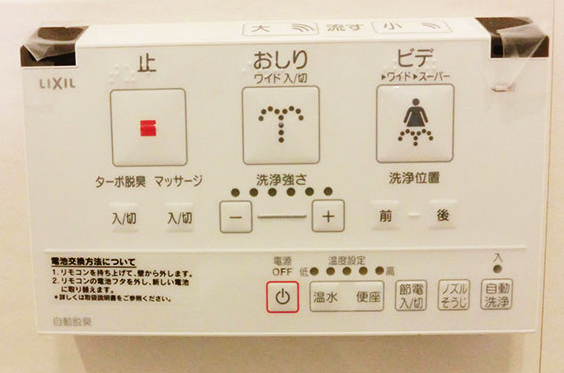 I’ve always liked the “BIG” and “little” flush options on Japanese toilets; they even have it on older types. The toilet automatically flushes, however, so I’ve never needed to use them. My first encounter with a washlet toilet was at the hospital when I was on exchange here in 2004. I had no idea how to use it, because I’d never seen one before. It was a curious experience, but I do have to admit it was a bit disappointing returning back to the dorms and being faced with an “ordinary” toilet again. Technology always evolves, and toilet technology is no different. Now they’ve come out with a brand new type of washlet toilet that can be controlled by your smartphone. That’s… convenient? If you want to check out more photos, commercials, and information about the toilet, visit LIXIL’s OHP. Back when the Roomba came out, I remember people being excited that a robot could vacuum their home. It was pretty cool, part of my family got my grandparents one for Christmas one year. You set up a docking place for the Roomba, and once it did its duty, it would return back to the dock. I remember it being much louder than I had expected, it would crash into things a lot, and my grandmother ended up running it only when they were out of the house. I have a feeling she no longer uses it. What you can’t see is a guy off to the right holding a remote control and directing the robot. So it isn’t fully automatic, but at least this way someone still needs a job! It’s also not very quick… but maybe this was just a test run. Okay, so maybe this one isn’t really a robot, but I think it comes close enough. Growing up, my grandmother was a hair dresser. She ran her own shop out of her basement, which is filled with dryers, a hair washing sink, products, combs, scissors, rollers, and of course, a spinny chair complete with a foot hold. I always had my hair done by my grandmother. 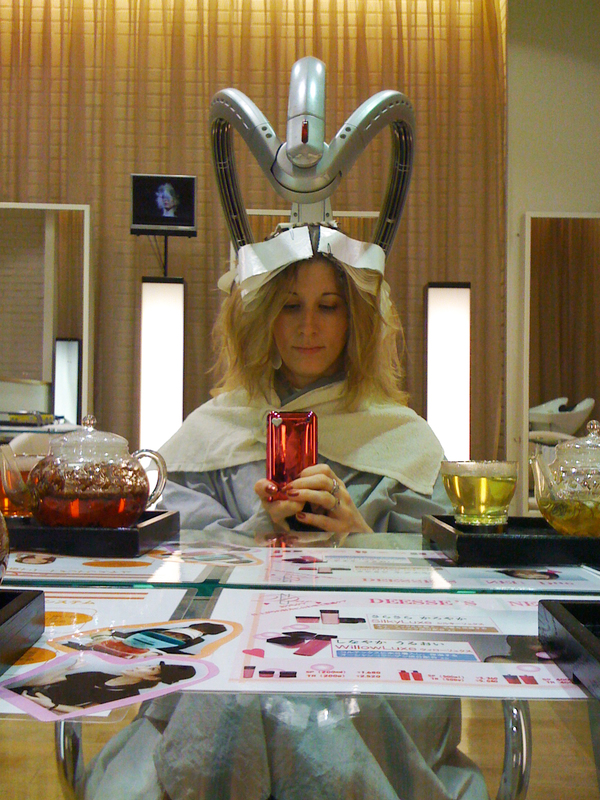 Getting my first hair cut in Japan made me a bit anxious, but a fellow teacher recommended an awesome stylist who worked in London for a good number of years. He understands my horribly fine hair, and speaks English brilliantly. Hair and health are two things I don’t want to have any miscommunication over. My first time at the salon I was amazed at the hair dryer. Maybe they’re industry standard now, but I had certainly never seen one like this before. With this hair dryer the little arms on the side flap up and down. I honestly never feel any heat coming out of them, but it does seem to dry my hair. It also sings, because a hair dryer that doesn’t is just silly. Unfortunately, I haven’t had a chance to record it, but it sounds much like the cleaning robot. It places a music box version of “Twinkle, Twinkle, Little Star”. You know how when there’s construction going on, there’s always one or two people who are standing out under the hot sun directing the traffic with their signs? On the especially hot days, you feel pretty bad for them, because it must be awful to have to stand there all day long. 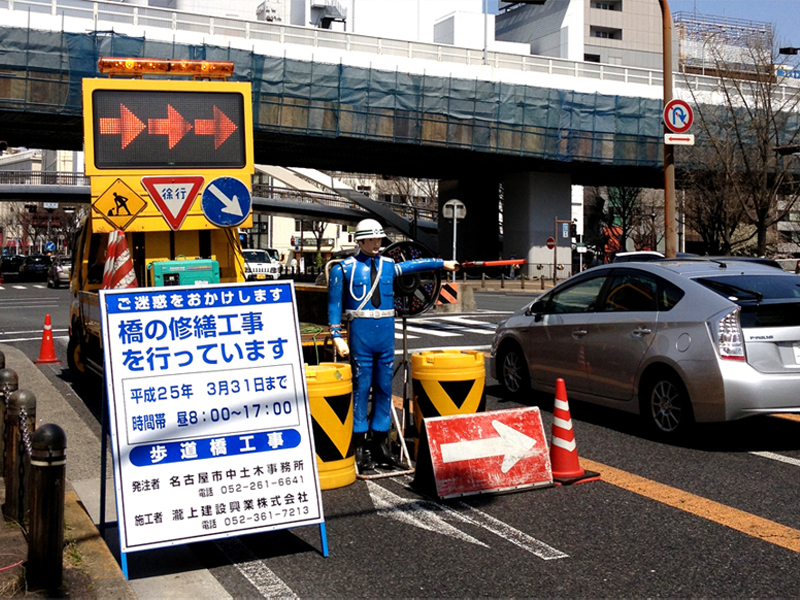 Well, Japan has fixed that problem, and replaced the human traffic director with a robot(ish thing), and tons of arrows. I love this guy. Apparently they’re pretty common here, but when I saw it about a month ago, that was the first time for me. The arm holding the baton just moves up and down telling people to veer to the right. I guess if they have to go left, they need to bring in another guy… one who’s a leftie. I’ve saved the most impressive robot until last. Believe it or not, the photo to your left is of a robot that they had on display and demonstration at the Aichi World Expo in 2005. I was studying here at the time, and a bunch of friends and I went to see what it was all about. I remember her very clearly, because I was totally impressed then (and still am now). She is pretty amazing, and can speak Japanese, Korean, and English. She was in a box, but you could try her out. She was an information guide, so you could ask her questions about the expo, or just see where the conversation led. Please note that this isn’t my video. I found it on YouTube. Her movements are a little choppy, but she’s pretty amazing! And at first glance, it was a bit hard to tell that she wasn’t human. They had a lot of other robots at the expo as well, so if you’re interested, you can check out the expo website that has a listing of them all (Robot Station). Well, there we have it. Robots in real life. What electronic or robotic devices have you seen around your community as of late? Anything fun and interesting? I’d love to hear about them, because it’s definitely fascinating. Wow!! The movements on that question robot are super smooth! I am impressed! I was so surprised when I saw him! Haha. Wow, very very informative. You did lots of research! I know there are so many visitors from abroad who are so much surprised to see Japanese washlets. Do you think this product can be global in the world? At the very beginning when I knew about it, I thought I would never have liked this. Now I think I can’t do without it at home. TOTO did a great job. I don’t think they’re as rare in other parts of the world as they used to be. We have them in Canada; my dad installed one in our house a few years ago. But they’re definitely not used in public restrooms yet. Maybe someday. © 2016 Adrienne the Canadian.com. All Rights Reserved.